Fares are valid for Midweek only Sunday - Thursday, surcharges apply for weekend travel. London, Paris or *Europe: Amsterdam, Brussels, Copenhagen, Dusseldorf, Dublin, Frankfurt, Madrid, Manchester, Milan, Rome and Zurich. Depending on where you are departing Australia from & your preferred destination surcharges may apply. 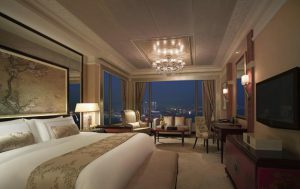 The hotel's stunning Presidential Suite is one of the most spectacular in Asia and the largest in Hong Kong at 7,000 square feet with a 2,500 square feet terrace with infinity swimming pool overlooking Victoria Harbour and Hong Kong Island. 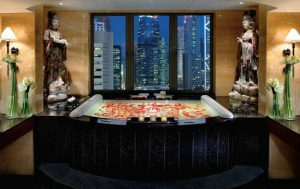 Located above Pacific Place shopping complex, in Hong Kong's Central district, Island Shangri-La offers luxurious rooms with free internet access, a 24- hour fitness centre and Michelin star restaurants. Today Hong Kong has become a great international trading post, a powerful manufacturing base and one of the world's largest financial centres. Summer (late May - mid-September): Hot and humid. Temperature may rise to 33°C (91 °F) with humidity up to around 90%. . Shirtsleeves, cotton clothing, a sweater for indoors and an umbrella for outside suggested Average temperature: 28°C (82°F), humidity 80%, sea temperature 28°C (82°F). Autumn (late September - early December): temperature and humidity drop. Clear sunny days. Shirtsleeves to sweaters and light jackets suggested. Average temperature: 23°C (73°F), humidity 72%, sea temperature 17°C (63°F). Liquor - A one-litre bottle of wine or spirits. Ivory - The importation and exportation of raw or worked ivory is governed by strict regulation. Firearms must be declared and handed into custody until departure. 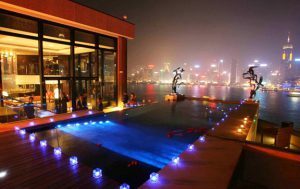 Hong Kong is generally considered a safe city by day or night. Policemen are very helpful, and those who speak English wear a red label under their shoulder badge. As in all big cities, avoid carrying large amounts of cash; traveller's cheques or credit cards are preferable. 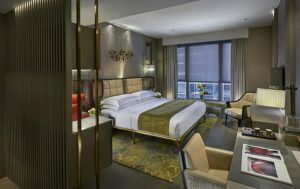 Make use of your hotel's safe-deposit boxes. Most foreign currencies and traveller's cheques are easily changed in Hong Kong, either at banks, hotels or moneychangers (check how much you will get in return before handing over your money). 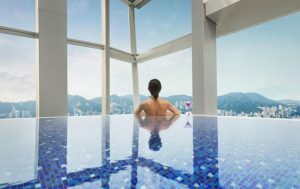 Hong Kong International Airport is approximately 40 minutes' drive by car from all major hotels in Kowloon and about 50 minutes' drive via the Cross-Harbour Tunnel from all major hotels on Hong Kong Island (under normal traffic conditions). If you are making your own way to your hotel, follow the signs directing you to the Transport Terminus for taxis or use the airport coach service. If you have no local currency on arrival, change only enough at the airport to get you to your hotel. Taxi drivers expect a tip, but just round up the fare to the nearest dollar. Drivers cannot pick up or drop off passengers on restricted streets, which are marked with yellow lines. New Territories taxis will pick up and drop off only in the New Territories. If you have any queries or complaints, note the taxi's number and call the 24-hour Police Hotline on 2527 7177. Fares range from HK$1 to HK$30.60. Exact change is required. You'll find that, in general the drivers do not speak much English. The Kowloon-Canton Railway (KCR) is 34 kilometres long and runs from Hung Hom in Kowloon up to the border with China. Trains run every tour to 10 minutes in each direction, and vary according to the ordinary single trip to Sheung Shui, the farthest you can go without a China visa). It's a go way to visit some of the New Territories' towns and villages. The Mass Transit Railway (MTR), Hong Kong's fast, efficient and air-conditioned underground system, runs not only along the north side of Hong Kong Island, but also from Central across the harbour to divide into east and west branches in Kowloon. Stations are located by a X symbol. Fares range from HK$4 to HK$11. MTR and KCR stored-value tickets (HK$70-200) are also available. 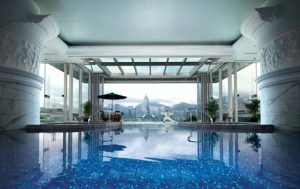 Enjoy access to Cathay Pacific's exclusive lounges when you fly in Business or First Class. For more information regarding Cathay Pacific's baggage allowance, please contact one of our Travel Specialists or check here.